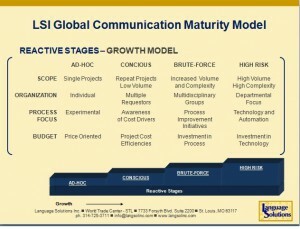 LSP Maturity: Ideal Customer Profile | Language Solutions Inc.
One of the translation industry’s research firm, CommonSense Advisory, approaches localization maturity from two directions: Buyer-side maturity (what we call Localization Maturity) and LSP Maturity (Supplier-side – Language Service Providers). Because we feel that Localization Maturity should be on the minds of any organization involved in Global Communications and have written about this for almost the past 9 years, we also have had a long term commitment to working on our LSP Maturity though continuous improvement. We’ll explore some of the activities we do in our own business through a series of LSP Maturity blogs. 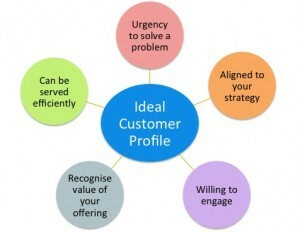 To kick things off, we’re going to talk about a recent exercise we did: The Ideal Customer Profile. At the St. Louis Product Camp in February, we took the opportunity to get re-energized on product and service strategies and insights. Dale Furtwengler is a favorite speaker at this event and his method for defining the ideal customer profile got our attention. 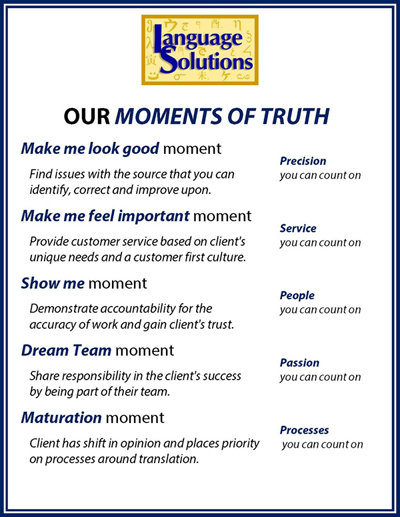 Our last major assessment of our customer profiles dated back to when we defined our customer experiences in our Moments of Truth. It’s a narrative designed to understand at what point in the experience with clients our value is being expressed, and how. 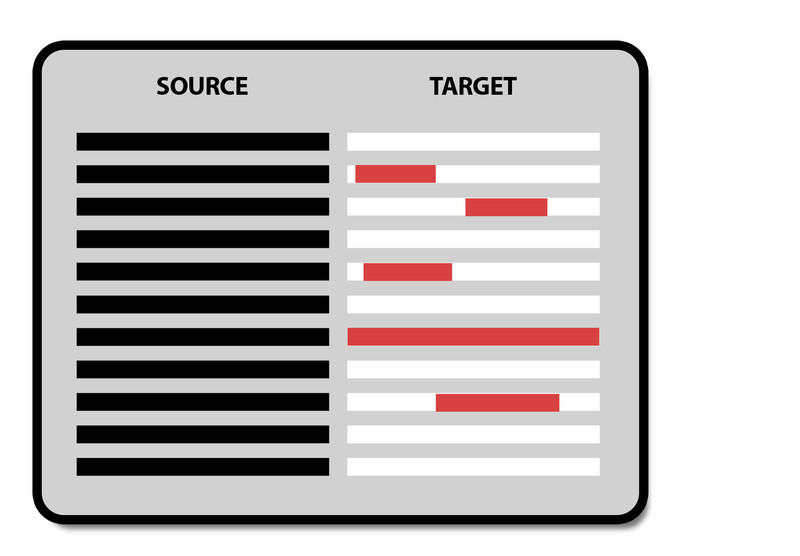 Dale’s approach to customer profiling got us back to thinking about the psycho graphic profiles that are ingrained in these ideal customers that we work with. Last year, when we redid the website, one of our proudest statistics was retention rate with our clients. Dale’s method got us thinking about why these clients like to work with us and what characteristics that they have make them a good fit for our services. Strive for Perfection – the are committed in their job and that strive in their own business and are value oriented in the service deliverable. Confidence -they understand the value of the work. We are not a threat to their bottom line but seen as a partner. Honesty – they treat others fairly. They value a sense of accountability and openness about the process. One aspect of a culture of excellence is to understand the customers you serve and know why they are a great fit. As an LSP (Language Service Provider), we always strive to serve customers better and dig deeper into that Voice of the Customer each year to see how we can improve on customer service. Constantly working on improving our business with the customer as the focus benefits the customer because we truly understand our business. We take the time to work on it with all staff involved and all opinions discussed. This focus on the customer is particularly important at early stages of Localization Maturity where the majority of companies that are involved with global communications have a greater need to involve their LSP to help them through the growth stages.